Preheat oven to 350 °F and coat a 9x13 baking pan with non-stick cooking spray. With an electric mixer cream butter, sugar and peanut butter until light and fluffy, about 5 minutes. Add eggs one at a time, beating well after each addition. Add vanilla, reduce speed of mixer and slowly add flour, baking powder and salt. Mix well. Stir in chocolate chips and spread into baking pan. Bake 40 minutes or until a toothpick inserted comes out clean. Cool, slice and serve. 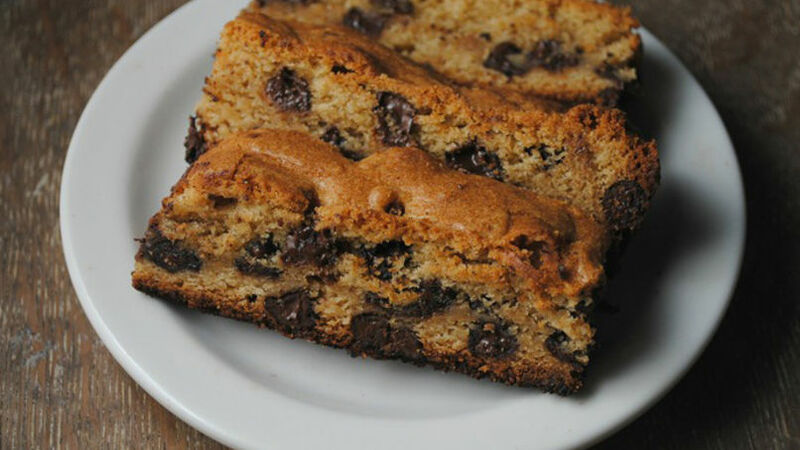 Swap out – You can replace semi-sweet chocolate and use white chocolate chips or try toffee bits. Tender chocolate peanut butter bars are a great afternoon snack. Wrap leftovers in plastic cling for a perfect lunchbox treat.